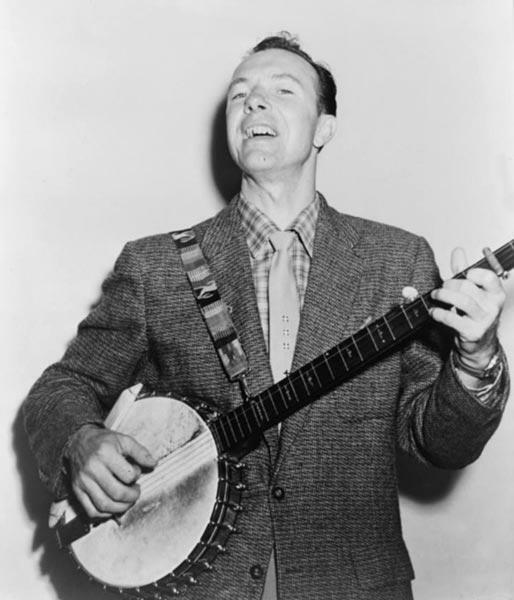 This post about Pete Seeger, the legendary folk singer, caught my attention the other day. The Ranting Raven is a friend of mine whose politics tend to skew pretty hard right most of the time. After reading his post I felt that I should offer some kind of defense of a man who I believe to be a true American hero. Raven seems to think that Seeger’s music - including famous songs like “If I Had a Hammer,” “Where Have All the Flowers Gone,” and “We Shall Over Come” - is all part of some kind of grand communist conspiracy to brainwash our youth and open our nation up to being set upon by commie hordes. The musical equivalent of putting fluoride in the drinking water, I guess. All of Seeger’s songs “were designed by a self-admitted communist for the express purpose of altering your outlook to be more favorable to the communist cause,” Raven rants. Of course, I think this is silly nonsense. But I was intrigued by the link he provides to a “conservative intellectual” who authored a lengthy article in some right-wing journal that calls Seeger America’s Most Successful Communist. It is true that Seeger was a member of the American Communist Party beginning in 1942 and that he continued to hold very strong leftist and socialist views after leaving the party in 1950. But some of the things that Husock alleges aren’t borne out by the facts. In keeping with the line adopted after the 1939 Hitler-Stalin pact (which caused many U.S. party members to quit in disgust), for example, the Almanacs warbled against American entry into World War II, foreshadowing the preference for peace at any price that later characterized the McGovernite Left. “Franklin D., listen to me,/You ain’t a-gonna send me ’cross the sea.” The group continued in this vein into the late 1940s. Note: The Almanacs was the musical group that Seeger was a member of at the time. An example of Seeger's pro-Soviet and pro-Stalin attitude can be seen during the period of the Molotov-Ribbentrop Pact, the short-lived alliance between the Soviet Union and Nazi Germany. His anti-war record Songs for John Doe, released in 1941, where he called President Franklin D. Roosevelt a warmonger who worked for J.P. Morgan, expressed his displeasure about FDR's increasingly confrontational attitude with Nazi Germany. Like most members of the CPUSA, Seeger was opposed to any action against Hitler from the time of the signing of the non-aggression pact until it was broken by Operation Barbarossa on June 22, 1941. After the breaking of the pact, Seeger along with the rest of the Almanacs, ordered all copies of "Songs for John Doe" be recalled and destroyed. Only a few copies exist to this day. After the invasion of the Soviet Union, Seeger returned to his earlier stance as a strong proponent of military action against Germany; he was drafted into the Army, where he served honorably in the Pacific. Seeger left the Communist Party in 1950, five years before Nikita Khrushchev's Secret speech revealed Stalin's crimes and led to a mass exodus from the Party. He became an anti-Stalinist but retained his belief in Socialism. So, far from continuing the ‘peace at any price’ stance into the late ‘40s, as Husock claims, we see that Seeger had already reversed himself by 1942 and then served honorably in the Army during WWII. Seeger was still a leftist. There is no doubt about that. But so what? All that means is that he had a good heart and wanted to help people who were suffering. Adding a line about peace in a Biblically-based song is somehow supposed to be subversive??? The sad thing is that Seeger was an extremely talented musician and songwriter who could have been far more successful during his career except that he was blackballed during the McCarthy period. …Regardless of Seeger's feelings about the Party, it didn't take him very long to realize that amidst the paranoia and reaction of the Cold War, the union movement had no interest in associating itself with singing radicals. In 1948 Seeger accompanied Progressive Party presidential candidate Henry Wallace as he toured the South, an experience that seemed particularly depressing and alienating. Soon the People's Songs collective Seeger had established in 1945 fell apart. On September 4, 1949, Seeger's car was attacked and his wife and three-year old son were slightly injured by shattered glass at the infamous Peekskill, New York, riot. Seeger's creativity has always seemed nurtured by adversity. Amid the siegelike climate of the late '40s, he and Lee Hays co-wrote "If I Had a Hammer," one of the most optimistic paeans to the possibilities of constructive social change. By 1950 Hays and Seeger, along with Fred Hellerman and Ronnie Gilbert, formed the Weavers and enjoyed instant success with highly sweetened versions of "Goodnight Irene" and other folk tunes. It is scary to think that the madness and hysteria of the McCarthy era could erupt here again one day. Seeger never shied away from doing what he thought was right no matter what it did to his career as a musical artist. He was active in the Civil Rights movement of the ‘50s and ‘60s, the anti-war movement of the ‘60s and ‘70s and, later in life, became very involved in the environmental movement. In 1994, Pete received the Presidential Medal of the Arts and a Kennedy Center Award. He was inducted into the Rock and Roll Hall of Fame in 1996 for his contribution to the development of rock. In April of the same year he received the Harvard Arts Medal. Finally, in February of 1997 he won a Grammy Award for Best Traditional Folk Album for his work, Pete. Perhaps Seeger’s music did have some influence on political events of the past 60 years, but if so all I can say is that it was to the betterment of our society and our nation. We are a better country as a result. Many conservatives, Mooney argues, have stopped regarding science as an objective search for truth (conditional as that truth necessarily is). Instead, they see it as just another realm of naked power politics or, less cynically but more ominously, as a contest between a pseudo-socialistic, tree-hugging worldview and one that is avowedly pro-Christian and pro-capitalist. Furthermore, right-wingers have mystified this conflict almost completely, cloaking it in self-defined terms of "sound science" (i.e., science that agrees with them, or reaches no conclusions at all) versus "junk science" (anything that might impinge on corporate profits or conflict with the most extreme version of Christian morality). New albums out by The Rolling Stones and Sir Paul McCartney and they both look promising. Critics are comparing the Stone’s new album to the best work they’ve done since the early 1970s. Likewise, I have seen glowing reviews of McCartney’s new album that say it is the best he has done in several decades. I’ll be interested to see how much of that is more than marketing hype. I’ll be happy with some halfway decent music. I don’t tend to be as picky as most rock music critics. I discovered the Stones in the mid-70s when they were in their Pretty Girls and Tattoo You era. But I didn’t actually buy any of their music until I was in college and the first one I got was Exiles on Main Street which is still my all-time favorite. I first discovered Paul McCartney when he was singing duets with Stevie Wonder. It wasn’t until much later that I connected him with the Beatles and became a huge fan. I really liked his late ‘80s album Press To Play which tends to get overlooked these days. As you may have noticed, Republicans, and more specifically conservatives, control nearly every aspect of the federal and state government today. We’ve had a Republican president since 2000 - one of the most partisan and ideologically right-wing ever to hold the office; A Republican-controlled House since 1994; A Republican-controlled Senate since 2002; A Supreme Court with 7 of 9 justices appointed by Republicans and appellate courts which are being stuffed to the gills with hardline conservative ideologues. And here in Texas, of course, we have complete one-party dominance thanks in part to Tom DeLay and his corporate buddies. And yet, what have conservatives really accomplished during this period of near total dominance of the political sphere? Of these, some are just plain liberal (3, 7, 8, 11), some were basically neutral or bipartisan (1, 5, 6, 9), and only a couple are clearly conservative (2, 12). Of the remaining two items, the stem cell straddle was....a straddle, and if the Iraq war is a conservative cause, it's only because George Bush is fighting it. Outside of PNAC circles, conservatives have not exactly been baying for more foreign wars over the past decade. The fact is, conservatives haven't won much of anything in the last 10 years except a PR triumph. Their biggest successes have been on taxes — a Pyrrhic victory at best without corresponding spending cuts — and in the court system, which hasn't actually delivered much real world benefit. Plus they have a war in Iraq, for whatever that's worth. Public opinion simply hasn't allowed them anything more. This lack of conservative “progress” has not gone unnoticed by conservative intellectuals who are beginning to complain. Here Ross Douthat poses some pertinent questions for conservatives to ponder as they consider where the conservative movement has lead these past few years. The problem for the conservative intellectuals is that the current batch of GOP politicians in Washington aren’t as interested in pushing for change as they are in lining their pockets and those of their political cronies. Has the buck finally stopped? for the federal government's failures in responding to Hurricane Katrina. 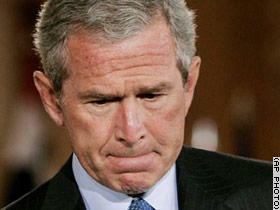 “Katrina exposed serious problems in our response capability at all levels of government and to the extent the federal government didn't fully do its job right, I take responsibility," Bush said. This will no doubt come as a shock to Bush’s most devout followers who are still in full denial mode that there was any problem with the federal government’s “speedy response” to the disaster. It’s September and so far I have seen only four movies that were released in 2005. That’s just part of the sacrifice of being a new parent. With a 2-year-old in the house and another due in November, it will be sometime before I start making regular trips back to the cineplex. So my movie watching is relegated to the videos that I rent or purchase. We made a special exception this year to go see Star Wars: Revenge of the Sith with some friends in Houston while the grandparents watched after the little one. Other than that, I haven’t been inside a movie theater at all this year. Hitch was pretty good, Constatine was OK and The Upside of Anger was a big disappointment that neither one of us liked. Are there any that I should add or subtract from the list? I thought I’d take a short break from my Bush-bashing crusade to talk about the new movies coming out this fall. The NYTimes had a beg write up on them this Sunday and the LATimes has a handy list here. I think the Johnny Cash biopic “Walk The Line” should be good with Joaquin Phoenix and Reese Witherspoon in the lead roles. Hopefully it will be on par with the Ray Charles biopic from last year. Another biopic on Truman Capote with Philip Semour Hoffman in the title role looks like a case of perfect casting. Then there is Tim Burton’s “Corpse Bride” as a follow-up to his “Nightmare Before Christmas” film. I can’t tell if Danny Elfman will be doing the music for this one but I hope he is. Disney is also coming out with “Chicken Little,” it’s first computer animated film that is not by Pixar. I personally think they need to reopen their traditional animation studio and just re-up their contract with Pixar, but I’ll check out the new films just the same. Republican leaders in Congress and some White House officials see opportunities in Hurricane Katrina to advance longstanding conservative goals like giving students vouchers to pay for private schools, paying churches to help with temporary housing and scaling back business regulation. Oh goody! Conservatives never seem to miss a chance to try and tear down the public education system. It would be one thing if they were offering the displaced students federal grants or hardship scholarships to go to private schools. But vouchers simply transfer money from the public schools which are already hard up and into the pockets of the private schools. Why do we have to reimburse churches for doing good works? My church is doing an enormous amount of work on behalf of the refugees here in San Antonio - collecting donations of cash, food and other necessities; volunteering time and resources at the various shelters - but the last thing I expect is for my church to get a big fat reimbursement check from the government. The churches should be doing things in addition to what the government has to do, not in place of what the government should be doing.